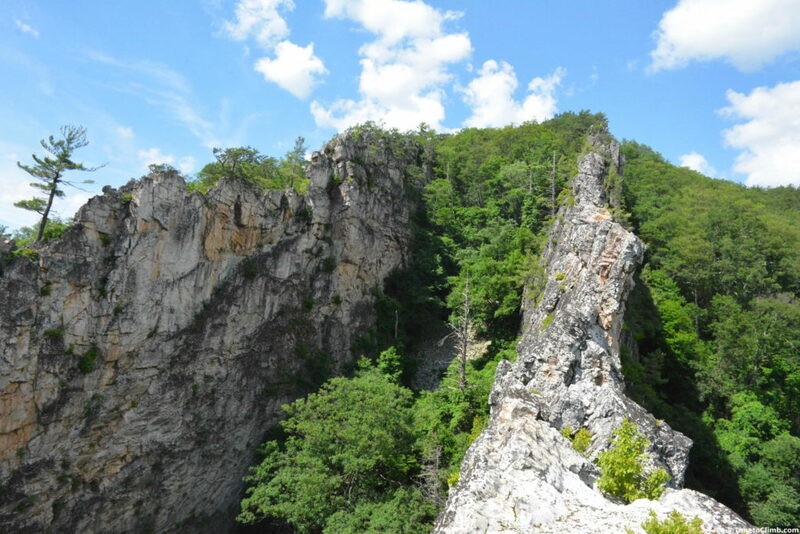 Rising over 800 ft above the valley floor, these unique dual razorback ridgelines are a feature many come to Nelson Rocks, West Virginia to experience first hand! Nelson Rocks, in the North Fork Valley of West Virginia, is located just 10 miles south of the famous trad climbing area of Seneca Rocks. 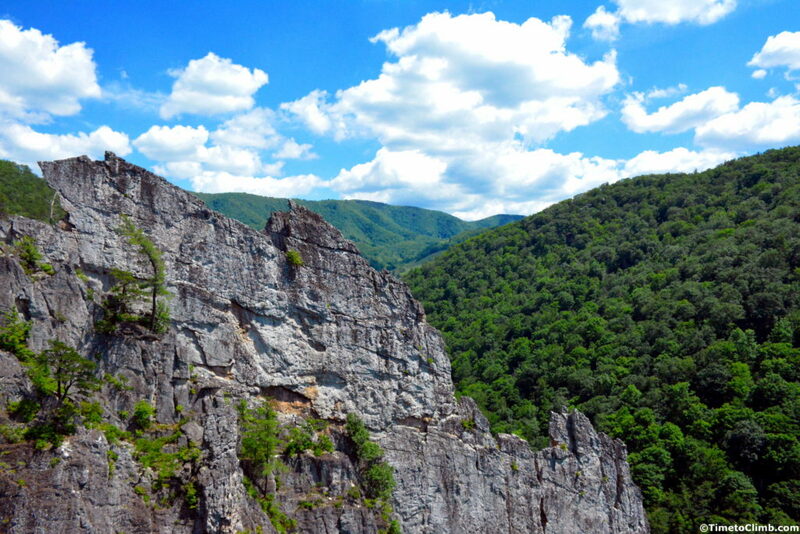 This unique rock formation is comprised of two razorback “Fin” ridgelines of Tuscarora Quartzite rock. 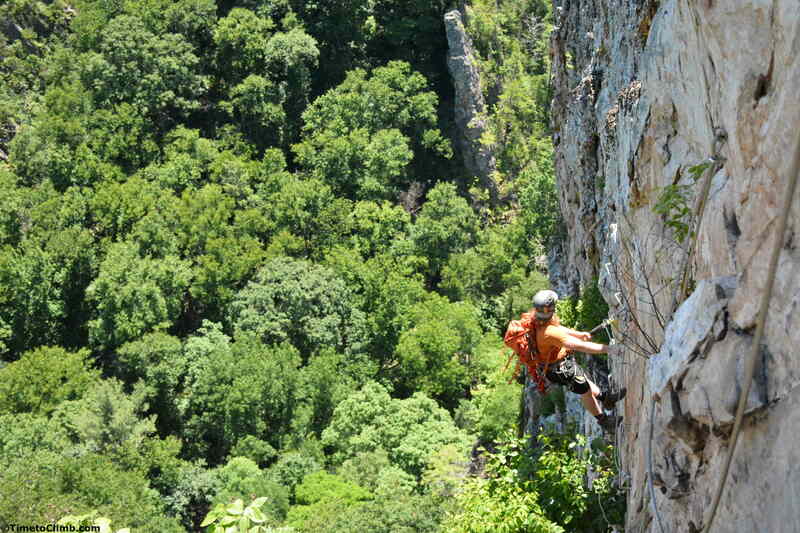 Climbing at Nelson Rocks can date as far back as the rock climbing found at Seneca Rocks. 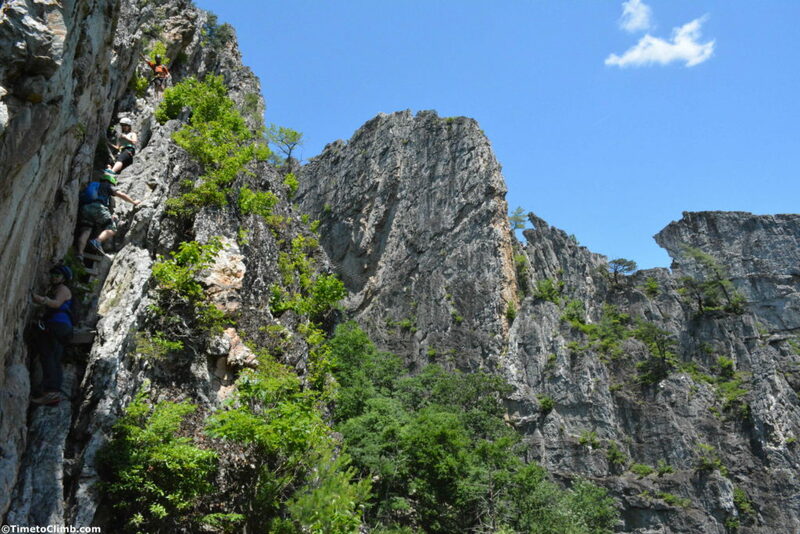 During World War II, the 10th Mountain Division of the United States Army trained & climbed on these very rock formations in preparation for their assaults of the mountains of Italy. 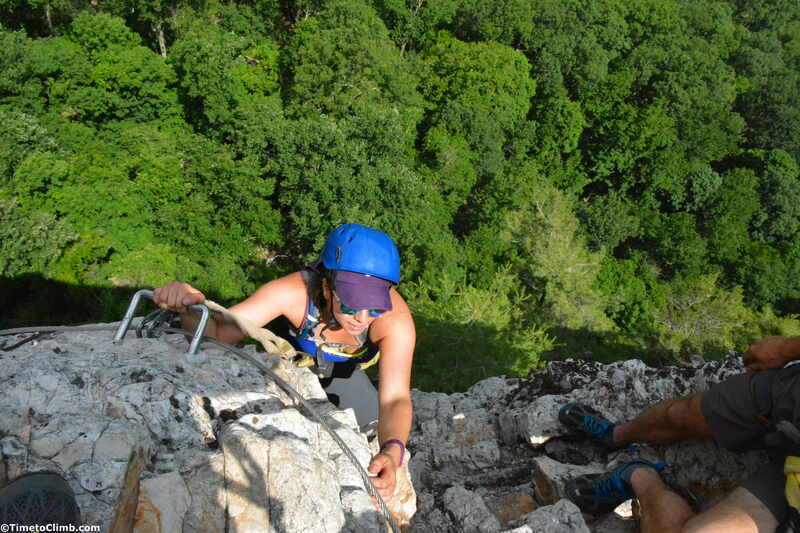 The term “Via Ferrata” is Italian for “Iron Road” and is used to describe a type of climbing consisting of metal rungs and cables permanently affixed to rock, thereby offering an easy means of ascending the cliffs on which they’ve been installed. 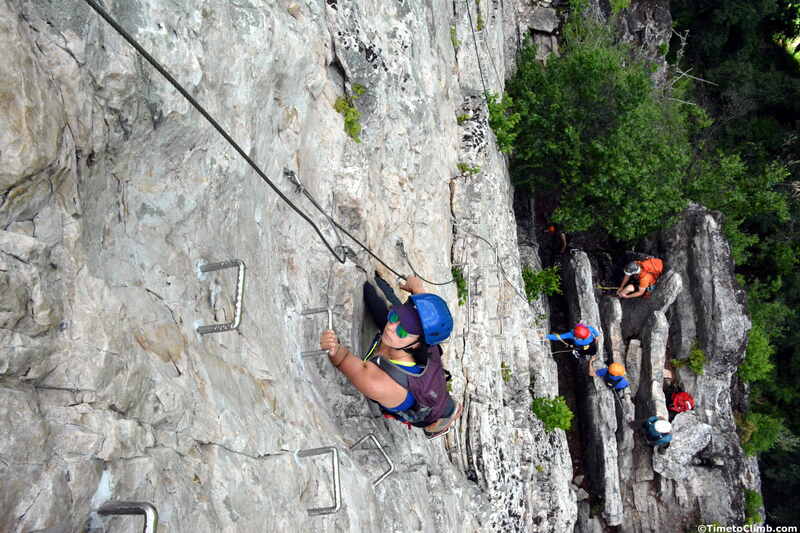 The equipment and gear used for climbing the via ferrata is similar to the gear used in other forms of rock climbing. 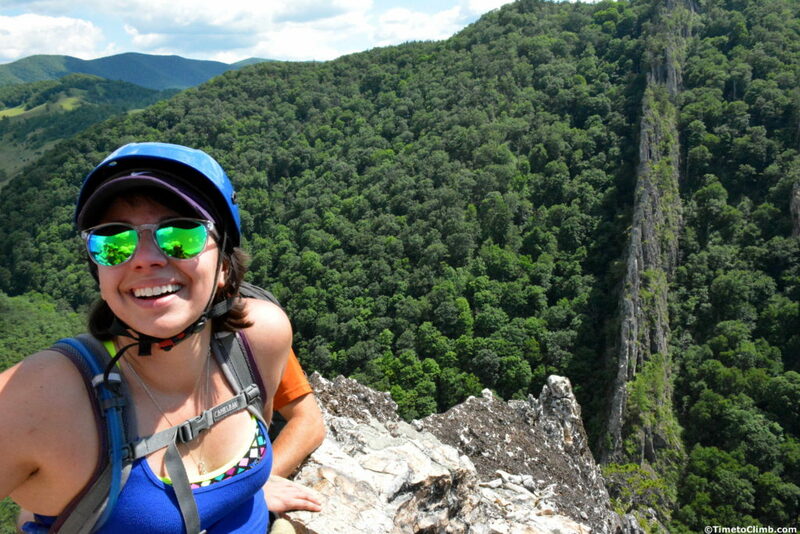 A harness, helmet and locking carabiners (for example) are used just as you would in sport climbing. You clip in as you climb up the route. 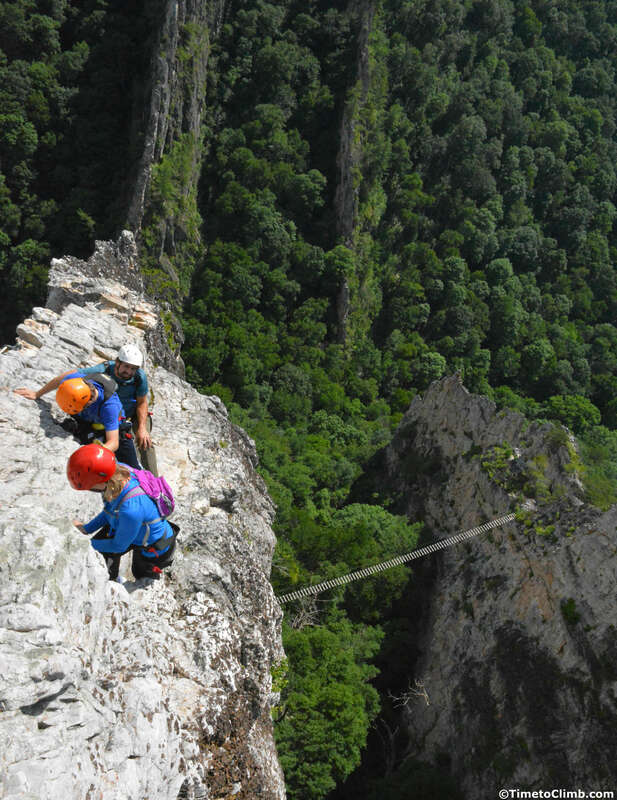 The major difference in climbing the via ferrata at Nelson Rocks, as compared to other forms of climbing, is that there is no rope. Instead, the climber clips into and uses the steel cables permanently affixed to the rock throughout the length of the entire climb. After introductions to our guides, gear instruction & tutorial, we got our equipment and made our way up the hill to the base of the cliffs. The metal rungs stick out about 4 to 6 inches from the rock and are spaced roughly half a body length apart from each other. 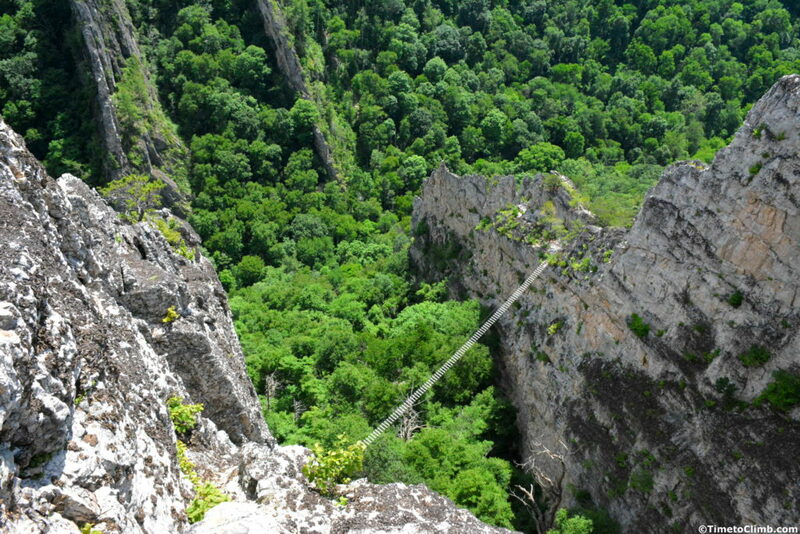 Depending on the section of the cliff you are climbing, the steel cable runs anywhere between 4 feet and 15 feet in length. Two locking carabiners on separate slings are attached to your harness (like a personal anchor system). Both locking carabiners are to be secured to the steel cable at all times. As you climb up the metal rungs and come to the next bolted section of the steel cable, you take one locking carabiner, un-clip it from your current section of cable, and then clip into the next section of steel cable on the other side of the fixed bolt. There is also a safety turn-lock gate carabiner attached to your harness. If you need to take a rest, simply clip this carabiner to one of the metal rungs and hang out. Remember, this is in addition to having both locking carabiners attached to the cable. The via ferrata at Nelson Rocks has a beautiful “window” notch in the cliff that you get to climb through and around to get to the opposite side of the first fin. After you climb through it, make sure to take a look back at the view of Spruce Knob in the distance. As you make your way up the inside section of the fins, take a minute to hang out and enjoy the surrounding views! 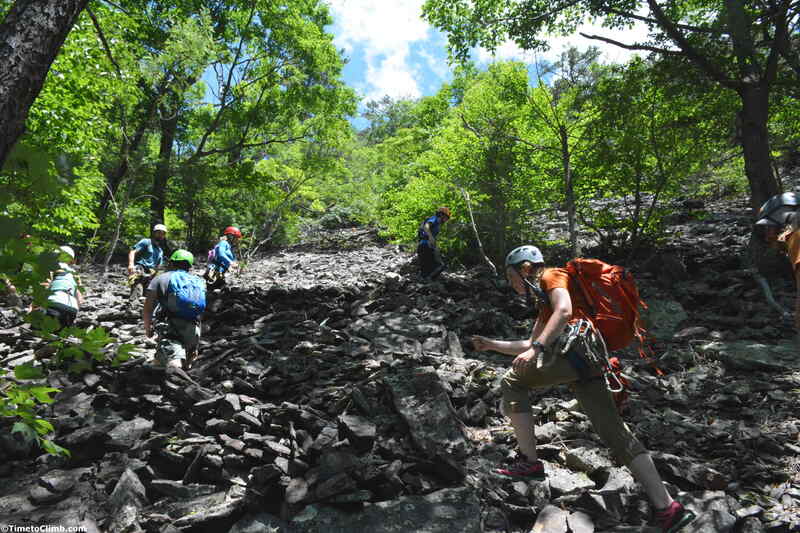 You’ll notice the guides hanging out, making sure everyone is doing okay, enjoying themselves and following proper safety procedures throughout the climb. The term “Razorback” & “Fin” becomes apparent once you cross through the notch and into the inside section of two ridgelines. When you look up, you will notice the massive headwall that towers 300 feet over the bridge crossing. At this point, you realize you are about to experience the true “meat & potatoes” part of the day! When you make it to the bridge, definitely take a minute to have a drink of water, eat a shot block and take a break. 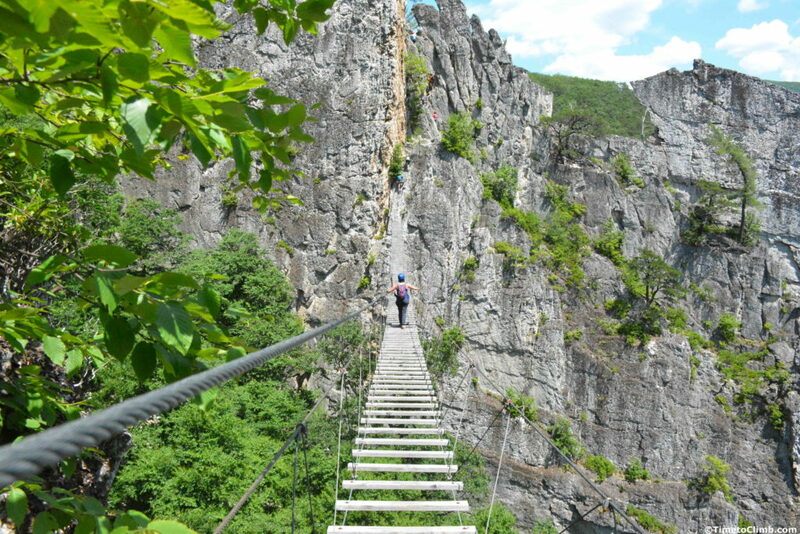 This is the part of the trip where most folks discover they have a fear of heights and suffer from sweaty palms. The bridge spans roughly 150 ft across and takes you over the gap and valley floor located 200+ ft below. If you are afraid of heights and have made it this far, I applaud you! Take the bridge slowly. 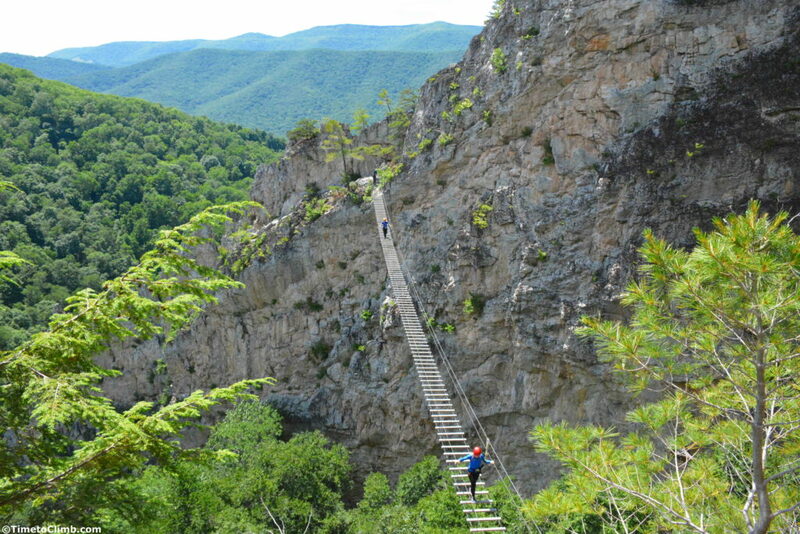 Each wooden plank is roughly a foot apart and will require you to look down as you make each step. You are clipped into the steel cable, but the bridge swings if you move too fast. **TIP- Let the person in front of you make it 3/4 of the way across the bridge before beginning to walk across. 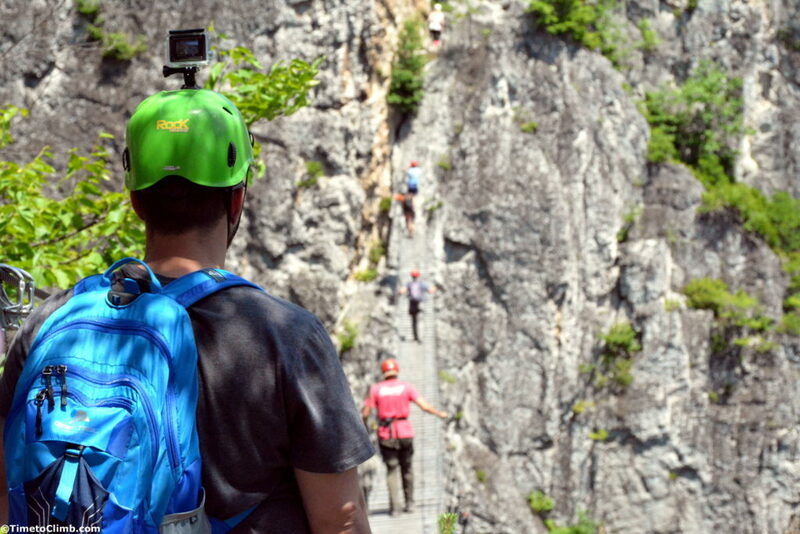 This will greatly reduce the amount of movement & vibration on the bridge** Once you cross the bridge and make your way up to the base of the headwall, you get an amazing prospective 50-75 feet above of what you just accomplished! At the base of the headwall you are given the option to go up an additional 60+ feet to the top or to sit this part out. It is a vertical climb with a 10 foot section which is slightly overhung, making it the most challenging climb of the day! 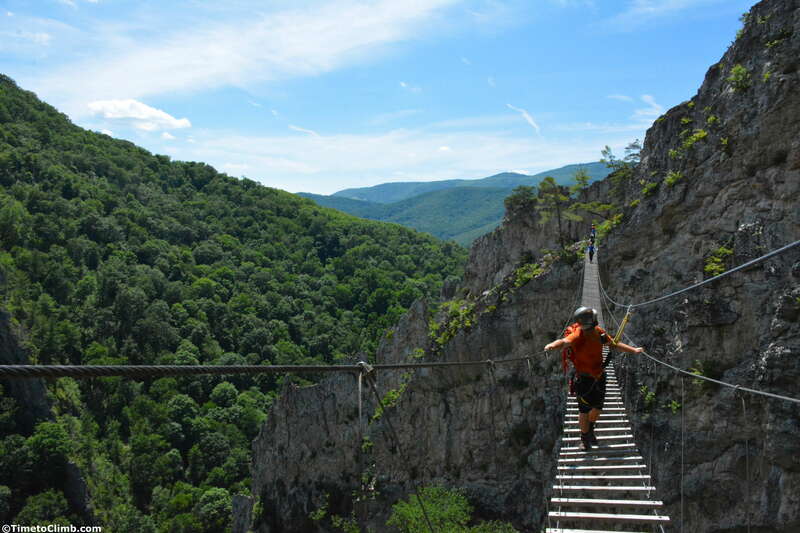 If you have made it this far climbing the via ferrata, I highly recommend taking it all the way to the top! The feeling of satisfaction and accomplishment when you reach the top is only paralleled by the amazing views you get by sitting on top of this massive fin! The headwall stands 300 ft above the bridge crossing, 500 ft above the ground and 800 ft from the creek at the bottom of the gap. This view gives you an incredible perspective to the size and formation of the Nelson Rocks! 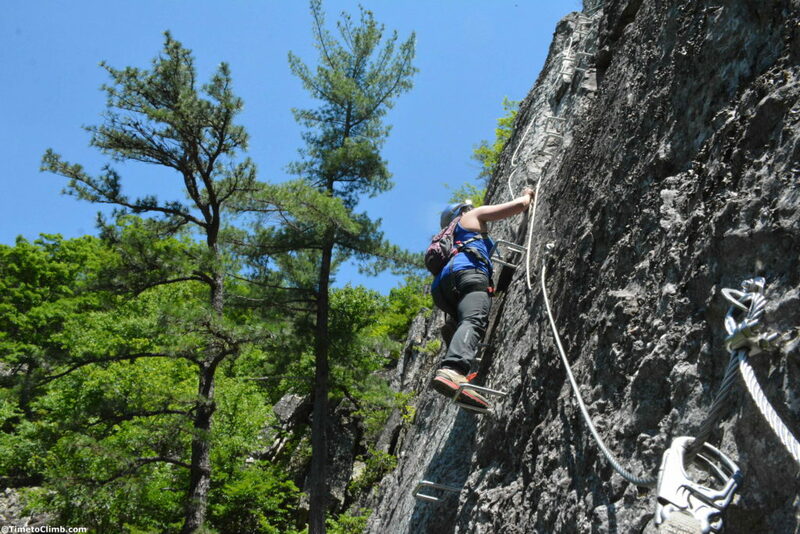 Once you are done hanging out on the top of the headwall you climb back down and traverse the rock formation for another several hundred feet, before hiking your way back out and down to the main building. If you are looking for an awesome spot to camp during your stay in the area, 10 miles up the road is the Seneca Shadows Campground (Seneca Rocks, WV). This campground is very well maintained and offers bath houses with flush toilets (in addition to pit toilets), as well as tent pads and a fire ring for each campsite. 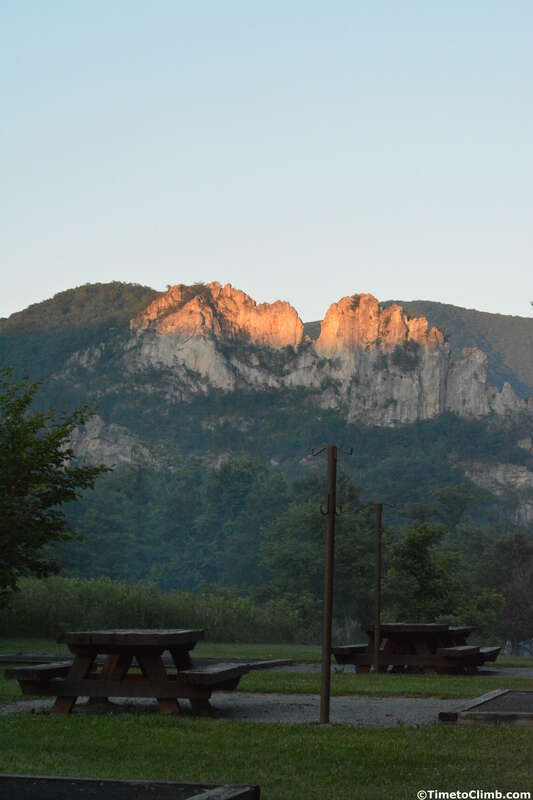 The location of the campground offers amazing views of the Seneca Rocks, especially during sunset. My girlfriend discovered this place when searching for via ferratas and realized this is only one of three found on the east coast (which surprised us both). 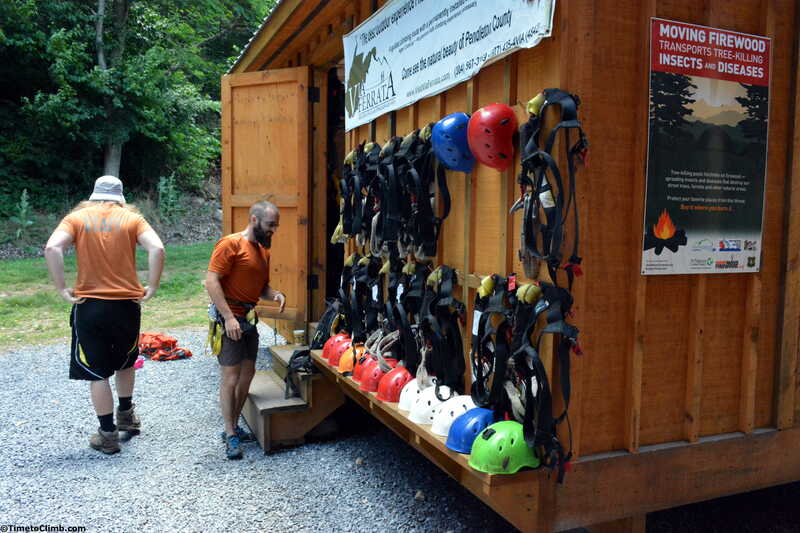 The others are located in Torrent Falls in Red River Gorge, KY and at Smugg’s Resort in Smuggler’s Notch, VT (after further research, this one is more of a zip-line & rappelling course). Regardless, the area along with rock formations looked super cool so we decided to come down, check it out and make a weekend of it! 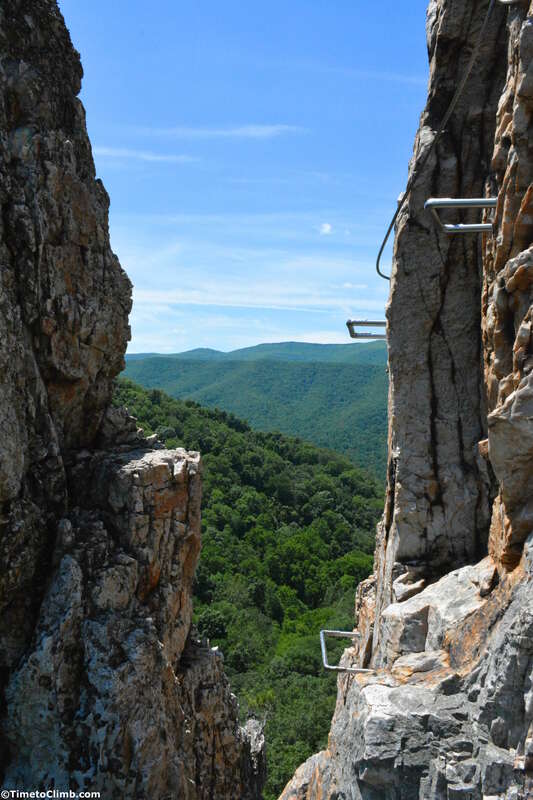 Nelson Rocks is privately owned and operated by Endless Horizons, a company based out of Harrisonburg VA. Rock climbing & the via ferrata at Nelson Rocks is only accessible via guided tours through the company’s subsidiary – NRocks Outdoor Adventure. The staff at Nelson Rocks was very nice and well-trained. I even had a conversation with one guide about his experience climbing Epinephrine in Red Rock. The equipment was in good shape, considering the traffic it sees, which made me very happy (I am a bit neurotic when it comes to maintaining gear). *Last Note & Tip- The area in and around Seneca has no cell service! The Nelson Rocks welcome center is the only spot in the area where we were able to find free wifi! * If you use google maps like I do for a GPS, make sure to connect here for your directions back home – otherwise you are going to drive blind for 80+ miles (like I did). Did you like this article & want to support Time to Climb? 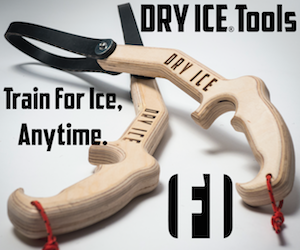 Free to sign up, Buy or Sell your outdoor gear and they give us a few bucks when you do!